We have decided to continue with this page as it provides an invaluable guide to current UK taxidermy prices. It is by no means a complete list but it does provide market trends and perhaps realistic expectations. The price list for want of a better word started life back in 2003 so soon will be 10 years of data. We hope you enjoy it. European Kingfishers by Allder of Newbury 1970 auction image. Note the mothed Pheasant below. Both cases had an estimate in 1970 of 50-100, which by todays standards was staggeringly expensive. This rubbish fetches the same today, perhaps a little more for the Kingfishers. 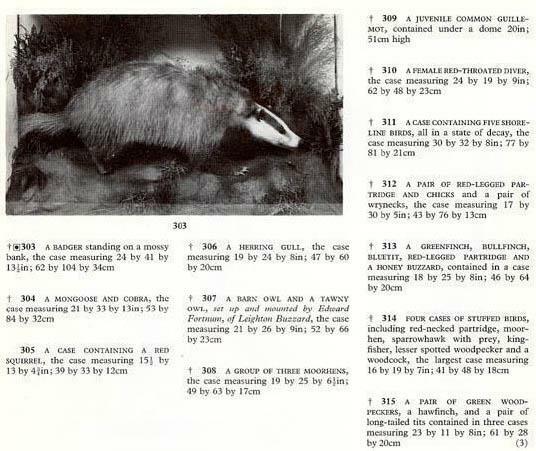 European Badger 1970 auction image. Cases had an estimate in 1970 of 50-100. European Fox 1970 auction image. Cases had an estimate in 1970 of 50-100. The main aim of the entire website is to both educate and the buy good qulaity Victorian and Edwardian taxidermy. Modern items will always also be considered but they items must be legally obtained and the work undertaken by Taxidermy Guild Members. With regards to Cities species they also must have the appropriate documentation also. Some interesting vlaues which as time goes on may serve as a barometer to future swings in this market. This information was compiled from discussions with taxidermy collectors, auction house data and the public sale of items on Ebay. The information was also compiled between 2003-present. Interestingly enough for those who perhaps view this collecting as an investment, in 2003 the average price per case was �0, whereas today the picture is somewhat different. The trend alas is still downward, recent high value cases have done nothing to alter this trend. Add to that the credit crunch and we anticipate that prices shall drop further. Some 1764 cases, that we are aware of have sold, totaling �6,495.32 giving an average cost per case sold of �8.87 Just update the pricing, we were expecting a massive hike in the average price with the recent sale of a large number of James Hutchings cases (Bonhams 2007) but this only increased the average case price by 22.00. Therefore the trend is still downwards. The diagram below contains a selection of taxidermy recently sold within the last 4 years. They are in no particular order of quality and or style, but this is the most recent data publically available, so it is current. The recent Bonhams sale 15th January 2008, some of the items have been included in this list have reduced the "mean" average for the case price lower still. Some items made above the expected estimate but most struggled. Since the demise of The Victorian Taxidermy Company, prices have fallen by half roughly. In 1996 240 cases were sold from the St Michaels Mount collection principly created by Cornish "taxidermist's". It is reported that the sale acheived �,000 that equates to an average of �.00 per case sold. my my, thats's value for money. Another exmaple of quality representation from this region. The trend clearly continues for british historical taxidermy in a downward motion. European Kestrel with chicks that looks to be the work of Lewis Hutton of Bristol. This is a Victorian case. Goshawk and chicks by Mike Gadd. 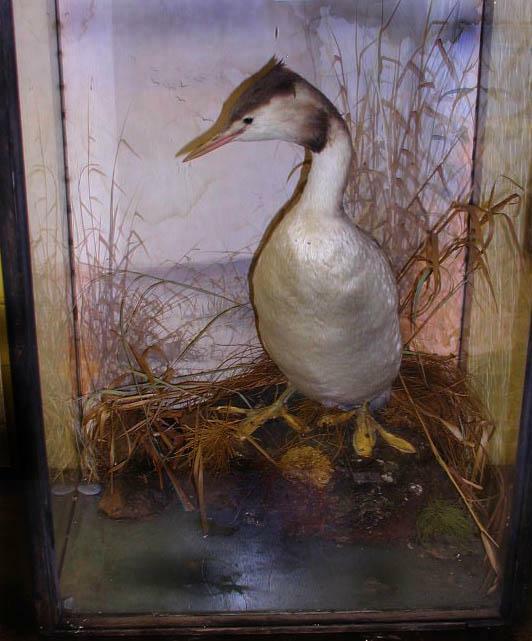 Modern European Shag by unknown but competent taxidermist. 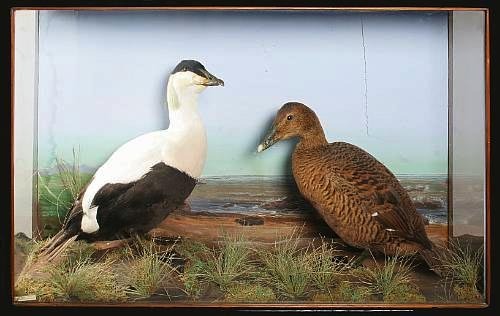 North Atlantic Eiders by William Hope of Edinburgh, this is a Victorian case. Interestingly this figure includes the current dispersal of the Andy Henry Collection on Ebay (The first collection in it's entirety to be disposed of by someone we all know). 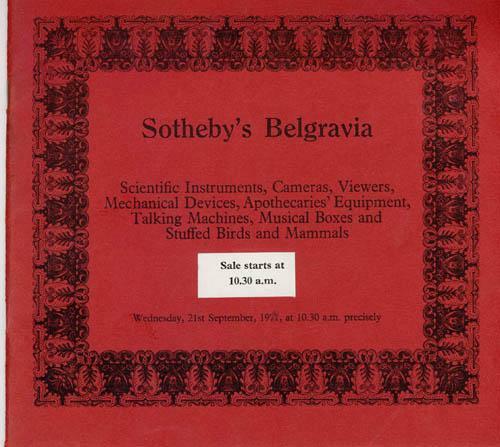 Clearly this data is now out of date and it does include include the partial sale of The Victorian Taxidermy Company's stock and the most recent large sales also. It does however make interesting reading and perhaps a guide to future prices. This is only a guide and does not represent the entire UK taxidermy market place, just a small personal view. The figures are accurate and it is our view that we shall see a steady decline in cost / value?, of cases in the future. Let's hope you did not buy at the top of the market so to speak. Not a good retirement fund. Also it is interesting to note that prices fluctuate between auction houses, Ebay and direct enquiries. That said we tend to buy direct these days and at auctions. Another recent development on Ebay allows for the seller to omit the bidders identities. Just a word of caution this allows the potential for the seller to ask others or themselves to bid the item UP to perhaps inflate a price. We are confident that this is not going on given the integrity of the sellers, just that it might. The general trend however of prices for both modern and Victorian taxidermy cases is downwards. However there is one concillation of this statement. Most of the items offered are total "shite" and not worth bothering with anyhow, no matter who bids it up so to speak. Hare's Mask Taxidermy Catterick Beagles 1951 280 Cased pair of Black Francolins 52.88 Hares head, Airedale Beagles 1947 By H. Murray 66.66 Otter Mask by Farren of Cambridge 101, before it got pulled??. Taxidermy Catalogue Hotaling Son Gloversville NY 1932 7.81 1883 Harper's Weekly 22.50 Victorian Blue Winged Kookaburra 295 Jeferies Woodpecker 27, how many times is this going to be bought and sold!!!!! TE Gunn Barn Owl 130 Cormorant by Hutchings 120, auctioneer failed to bid for us. Barn Owl by Hutchings 100, auctioneer failed to bid for us. Rowland Ward Buzzard 130, auctioneer fails again. Night Heron 111 Lyre Birds 296 European Rabbit 40 Peter Spicer Fox mask 155, we just love our site being mentioned on Ebay. A cased and mounted Bittern by JA Cole 513 A cased and mounted Curlew by JA Cole 187 James Hutchings Albatross 2106, yes that is what was paid but not asking that now. Lets see how long he keeps it. Could always save it for the nation??. Perhaps not, better still!!!!! just sell it to the Americans!!!!!! Peter Spicer Golden Eagle with no case work left 2945. Makes others cases now worth a fortune. We should have bought them all when we had the chance!. Male Bullfinch in wall hanging dome 70 at the moment but we will own it? Toddle pip. Tawny Owl by Roberts of Norwich 165 Pair of Bitterns 500 Stuffed Owl Decoys Taxidermist M.J. Hoffman of Brooklyn N.Y 27.00 Isolationists?. Not sure what you mean another Englishman bought this card?. Oh by the way if you wih to live up to you claims on your front page, you might want to remove the Ebay logo from the image that you have. Congratulations MC on your purchase of the card by the way. Rowland Ward Hoof 67.99 Mallard by John Cooper 390 Peregrine by William Hope suggested as Hutchings 235 Rowland Ward Mallard 0, did not sell. Solution?? ?, readvertise 100 pounds more than previous. Genius!!!! !, should be a taxidermy dealer. AJ Armitstead Fox head 104 Mistle Thrush by Cole of Norwich 75 Yellow Wagtail by Vingoe 26, another quality cornish case, we think not Jackdaw by Geo Bazeley of Northampton 130, once owned by Andy Henry. 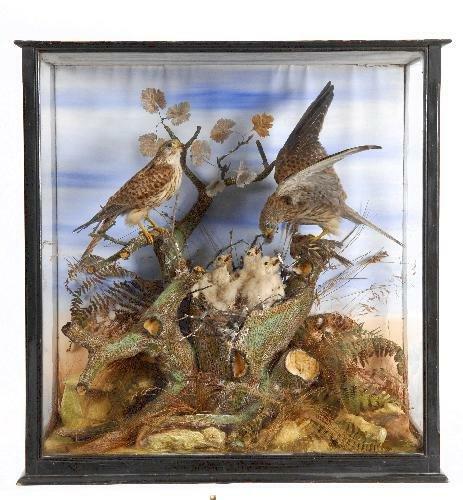 Victorian Grouse in 5 sided glass case 52 Budgie in octagonal case 82, before it got "broken"?, lets see if it mysteriously mends itself Large case of seabirds and waterfowl 180 Red Throated Divers by Bisshopp, wonder how many emails the chap has had to "buy it now"?? 450. We suspect that these bird may require restoration. 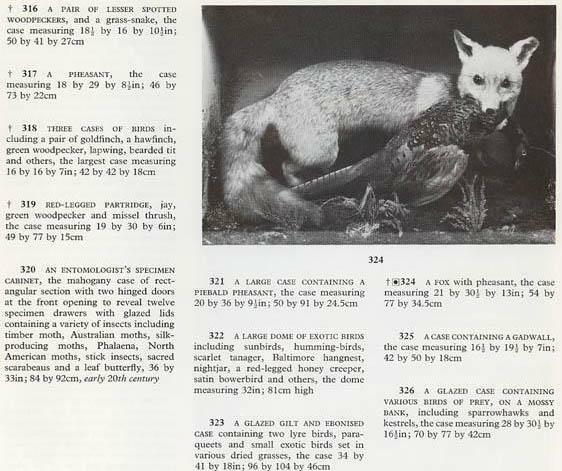 Otter head and tail by H.murray&son 232.19 King Penguins 320 Hen Harrier and Lapwing prey 260, before it got "pulled" TE GUNN Pheasant and Red legged Partridge. Apparently there is a site dedicated to TE Gunn. YEAH, we know!!!! 159.99. Not another bargain? Peter Spicer Otter Mask 213.66 Peter Spicer Fox mask 73 Original bird drawings by Eric Gorton, taxidermist 45 Griffon Vulture 337.50. Not an other "sympathetic restoration"
Grubby Cormorant and Water Rail by James Hutchings. He not always did good work clearly 230 Roach by Homer of Forest Gate 350 Red Squirrel and Barn Owl by Allen of York 6.37, the glass was worth more than that. Pair of Owls by James Hutchings from Jubilee Auctions 575, oopps, bit of a bargain to be putting on ebay. Rowland Ward, Pica's, if we wanted them we would have bought them from the same auction house as you did 150 Ravens (3) by Peter Spicer 9.00, yes pounds, image to follow. Choke on that 9.00 Kittiwake by H Murray of Carnforth 1020. Nice case but the glass is not original, needs re-taping and also the painting (print actually, according to the Murray expert who reviewed the case) has water damage over most of the sky. Other than that a nice case. Osprey by Cullingford of County Durham 900. Restored recently, but nice item. Original "pair" from the Andy Henry Collection sold for 1000, so I suppose you pay's your money, you take's your chance. 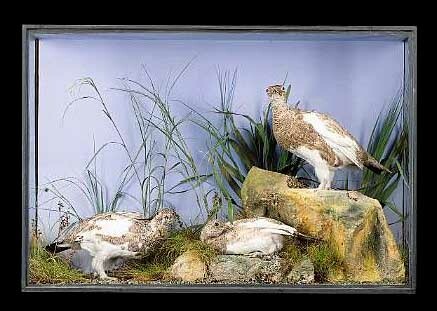 Perch by Lowne of Yarmouth 160 Virtually faded white Short Eared Owl by TE Gunn 300 Case of mixed British Birds by unknown taxidermist 260 Pike by John Cooper & Sons 560, the last one offered to us by a dealer was for 2000. Must have been a special one?. Badger & Stoat with Dunnock prey (very bright yellow groundwork) by James Hutchings 300 Barbel by John Cooper & Sons dated 1925, 1625 Polecat by Lowne of Great Yarmouth 22, yup 22.00 Fox wih Rabbits, commonly known as "ambush" by Jefferies 180. The last case acquired by this artist made 750. You do the math. Mixed case with two Tawny Owls by E Allen 155 Gorilla death mask again 108 Dotterel by Lee Yafano 480 Capercaille by Peter Spicer & Sons 6404, which frankly is enough. McCleay letter 60 Letter by Lewis Hutton 22 Hen Harrier by Hollis 190 Eel in bow fronted case 99, modern copy. Trout by Mountney of Cardiff 92 Spicer Fox mask 31 Pike by AS Hutchinson of Derby 137 Fox head by J W Quatremain 32. Not so long ago this would have been fought over. Spotted Crake cased by Jack Fishwick, 77.00, now this person regularly wins UK taxidermy championships and frankly that sale price is insulting. Little Owls by James Hutchings 1560 Bissopp of Oban letter invoice dated 1912 but torn 157 Pair of Capercaille by Peter Spicer & Sons 2400. Our man on the ground had some reservations. He suggested that those who won might have been better viewing the item first. Lovely image though on the internet. Cased Brown Trout 210 Badger by James Gardner 150 Koala Bear by James Gardner 2300 Pair of John Cooper Rudd 510. We were expecting to pay more for these but as stated anything of quality will be purchased. Budgie by Rowland Ward 163 Set of 20 Watercolours by George Herd, taxidermist to TE Gunn. 160 Green Woodpecker by Farren 22 Widgeon by Peter Spicer, 150. Got to be one of the cheapest to date. Thanks very much. Arctic Skua by Robert Duncan 300 Single cased spotted Brown Trout by John Cooper. 240. Cannot understand why so little. Little Terns by TE Gunn 240 "Peregrine Falcon, `Falco peregrinus, Nocton Wood, Lincolnshire, 1925`" 140. Perhaps not as valuable as once thought. Pair of Jays with the wrong colour eyes by James Hutchings 320 Long Eared Owl and scruffy Barn Owl by James Hutchings 280 Salmon by Malloch of Perth 280 12lbs Pike by John Cooper & Sons (Griggs) dated 1949. 1000. Very nice fish, image to follow. Common Carp by Homer of London 280 large but early seabird case by James Hutchings 520 Brent Goose and Arctic Skua by James Hutchings 300 Fox with Rabbit prey by Lewis Hutton of Bristol 88.00, due entirely to fading which is a shame. Really bad John Cooper Goldfinch 97.99 Chub by John Cooper dated 1949 in bow fronted case 505 Pike by Pratt of Brighton 330 Peter Spicer Sparrowhawk with Crossbill prey 1099. This is a fantastic case and perhaps the end price reflects current market conditions?. Lioness skull 350 dome of uncased tropical birds 1000 Perch by Homer in need of restoration 240 Peter Spicer Rd Grouse with chicks. Nice case 500, from Faggin's antiques to serious collector, perhaps for serious money also. Fox with Mallard prey by James Hutchings 570 Fox with Woodcock prey by James Hutchings 220 Kingfishers by James Hutchings 1350 Large decorative case by ward of exotic birds. Starting bid of 3500 to sweep away the dealer mugs. Case sold to private collector for 8000. Clearly nomorebargins. Pair of Gargeney Teal by John Cooper in bow fronted case 170 Black Headed Gull by TE Gunn 120 Teal by Hine of Southport 430 Pair of Tawny Owls by Murray of Carnforth 400. Seller was over the moon when they discoved what Murray cases really sell for and no doubt the buyer when they realise the add value margin. Still that's dealers for you, all that added value. Here's a top tip for those wishing to participate in UK auctions. If you wish to win the item, you need to keep your hand up the longest!!!!!!!!!!!!!!. We would not recommend "stepping out" as it is not worth it in the long run. Another informative gem from the T4C auction team. Been a bit of a mixed bag this year. Junk making thousands and quality making what junk should have made. Why oh why are people paying the prices for those domes full of mothy tatty exotic birds?, are you "special"???. Bazeley, perhaps not the best made good money for what is essentially inferior work compared to Hutchings, Cooper or Rowland Ward. Perhaps not the best items to buy if you are a dealer as the margin if any was eroded when you bought it. Peter Spicer cases have also either done very well and or very badly. Hutchings cases are still surpressed due entirely to mass production as is the stunning work by John Cooper, which always never ceases to amaze how low it can sell for. If you are cash rich now is the time to buy and if your skint, hold your nerve perhaps. Oh and people ruffled feathers and feathers in the cases normally mean moth damage, not the bird going through it annual molt, its dead remember. Here's something to amuse and reported to us by numerous sellers. Why would a person drive say a round trip of 100 -150 miles just to tell you that the item they then see in front of them offered by you is less than perfect. Perhaps they are doing you a favour? by offering you practically nothing for it?, again why make the trip, ultruism?. We would suggest perhaps not. Perhaps they are trying to grab a bargain, remember people, there are NO MORE BARGAINS. If someone says it is nice but.........., the but means you are going to have your bum smacked on price. Just a thought, as dealers are there solely to make a margin for dealers, nothing more than that really. November 2010 onwards has seen a steady and un-relenting decline in the "value" of taxidermy, with perhaps the exception of Peter Spicer and some of the more rarer items of fish (we know of course) produced by the likes of John Cooper and Bertie Griggs. Provenance also plays an important element in retained "value" and where possible invoices, letters and images should be retained when you are deciding to sell the item you have. It does make a difference. Now it could be argued that this is limited data and rather jaundiced as it does not include Rhino (Are horns on shields really taxidermy?) and big game. And.... you would be completely right in your observations to that effect. If you don't like the data, go create your own!!!!. This is just a personal view based upon nearly 10 years of collating such information. Another general observation is typically and I use the term typically a collector will state this case is by ...... and its value is ........ Who cares, we don't. We can only tell what our respective collections cost. Value is meaningless as on the whole, THEY ARE NOT FOR SALE. Again by far the greatest single artist to fall in "value" is James Hutchings, the "Caveat" being that rarer species still rally, but the industrial nature of production means that Foxes by example are very common and therefore have significantly reduced in value. 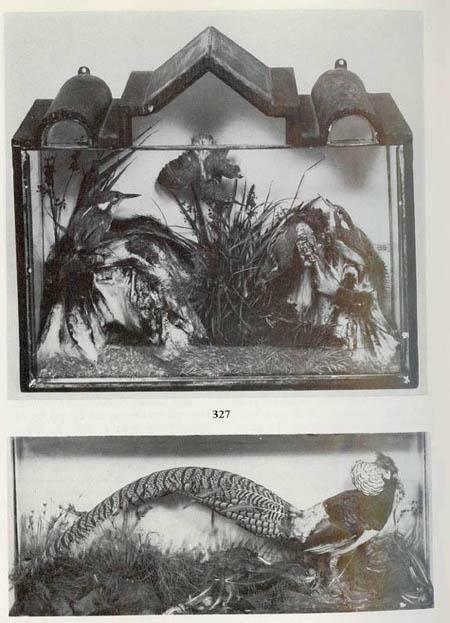 John Cooper (fish taxidermist) has also faired less well, due in part to forgeries and also the state of the market. Cheapest Cooper pike recently sold for �0 and Trout, Tench and Roach are now in the 250-350 region, a massive decline from the heady days of �0 plus.....Strange given the resurgence of interest in taxidermy broadly. Perhaps good if you are buying (collector) and less good if you are selling (dealer). One location where prices have recently gone BONKERS is Australia, one can only deduce "supply v demand". We feel that people need to be more realistic as to price acheived these days. Better still retain the items and do not sell as it is a buyers market with what is frankly a discreationary purchase. Pay the mortgage or buy a case?. Peter Spicer have always tended to command higher prices due in part to their less industrial nature of production. That said the fox, hare and otter masks have been produced in very large numbers over the years. We feel that the spicer cases reflect who is bidding and who thinks is bidding rather than the quality conveyed in each case. There are some better quality taxidermists out there like Cullingford, Murray, Thorpe, Ward, but "Spicer" appears to bring out the inner child in people, with all the character traits contained therein. Bit play-ground mentality which does amuse. Perhaps some should stick to playing conkers. The birds themselves are pretty average from a "taxidermied" perspective. By example not using the correct beak / eye / foot colours and using specimens that were caught in "pole-traps" with the resultant amputated look, doesn't really work when viewed with a trained eye. It is the combination of groundwork / and perspectives used by the watercolours that combine to create a pleasing effect, as without that combination then its just average work. Now you may disagree, but remember this is just one persons perspective. If you like Peter Spicers work, that's fine also. It has to be stated here that some modern European taxidermists work is far superior to both that created in the UK and most of the work produced by Peter Spicer. It is a shame that they are simply not interested in the groundwork / background combination. If they did then truly it would be some of the finest collectible work around. I suppose Spicer's work is decorative when viewed as a whole but borkern down into component parts then it has its faults. Cullingford on the other hand did not have anything to hide the taxidermy with. Austere cases, so the birds had to be feather perfect, which they tend to be. He did however have a tendancy to also put Grebes on their backsides which is a pity. Recent auction (September 2011) of Hutching's and Jeffery's cases yeilded little more than �0 per case, so unless you are really thick then we suggest you buy from auctions rather than dealers as at the moment these prices are a steal. An interesting development on prices that we would like to share. We recently offered to purchase two Hutchings cases, namely a Heron, Water Rail and & Kingfisher in one case and a Fox with English Partridge in the other. Not exactly rare but nice items all the same. We offered �0 for both cases. Yup that's �0 each for the hard of thinking. The seller, after accepting the initial offer, then elected to offer them at auction, presumably under the impression that they would make more. Indeed they sold recently for a combined total of �0. Take away the sellers commission at 15% and you are left with �7. Minus the effort to get them to the auction house (petrol) � and you are left with �7. We declined to bid at auction but were very interested in the sale results. Perhaps we are offering too much these days?. The seller would have needed to acheive �0 at auction to beat out offered price and frankly that we never going to happen, not these days. Also the cheapest James Hutchings Fox with Partridge prey sold at auction recently fetched 90.00 (April 2009). We wonder if this price will be "improved upon". In 2003-2005, these pieces routinely made 500-700 and in a few cases these made in excess of �00. As a crumb of comfort for those who feel that this is a sound investment, the rest of the economy is doing even worse, but given that this is discretionary purchase (mortgages and bills / loans etc taking precedent for most) this it should not be a surprise to see this unfold. We have certainly encountered a massive hike in the number of cases being offered privately. 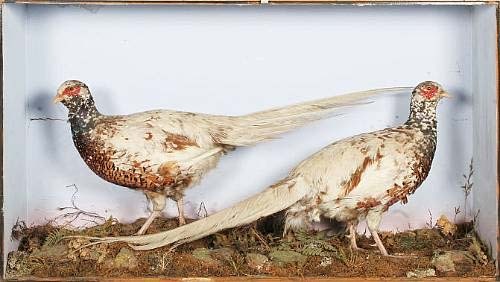 Also the cheapest James Hutchings case offered in open auction has to be the Abberation Woodpigeon, conventional Woodpigeon and Pheasant. We are assuming that most of you would have seen it, if not tough. Anyway it made (drummmmm rollllllllllll) 72.00. Very little to add to that. Since 2003 prices for victorian taxidermy have gone from an average of �0 per case to �0 per case as we see today. Now not wishing to dispel the hopefulls who feel that taxidermy is a sound investment, we would recommend to perhaps think again. Our advice is collect it because you like it, if it makes money over time then clearly you will be "up". However certain peoples mindset is stuck in 2003 and likewise their expectation as to "value". Deluded is a term that springs to mind. When certain people describe "value" what they are in fact is referring to cost. As one prominent person once said "people know the cost of everything and the value of nothing"
Here is a good example of value verses cost or cost verses value. Immaculate Rowland Ward Barnacle Goose (see Rowland Ward page for image was �.00 from Andy Henry in 2003 (long story and yes he was alive, so no bottom feeding at his auction). Now is that it's value or cost.? Rumours have it that the Farm house in Wales, the origin of sooo many cases by James Hutchings has burnt down. It appears that no more cases will eminate from that source in the future. Pheasants by Leadbetter of London, this is a Victorian case. Ptarmigan by Lewis Hutton of Bristol. This is a Victorian case. Great Crested Grebe by Peter Spicer. Another cased gem, that is both fresh to the market and not for sale. Restoration required and it will look fantastic again.